Seasonal affective disorder (SAD) can have a huge impact on your wellbeing and how you feel during the winter months. Symptoms often begin in the autumn as the amount of daylight hours start getting shorter. Symptoms of SAD include having a persistent low mood, feeling lethargic and lacking energy, having problems sleeping or finding it difficult to get up in the morning, feeling stressed or anxious and having difficulty concentrating. You may also experience cravings for comfort foods. At this time of year, we have little to no sunlight and this can leave us very short on vitamin D which can have a big impact on our mood. Vitamin D would be at the top of our list of supplement recommendations. It’s an essential part of your winter health first aid kit as it also provides immune support. We always recommend that our customers have their vitamin D level checked by their GP to determine their current level in the first instance. This helps us to advise accordingly on the right supplement and most effective dosage. To combat the symptoms of SAD, one of the first areas we would look at is your diet. We would advise eating plenty of lean protein such as chicken, turkey, tofu and Quorn, lots of leafy greens whilst increasing your intake of mood-boosting fats via omega-3 rich foods such as oily fish or non-fish sources such as linseeds and flaxseeds. Eating more complex carbohydrates (wholegrains such as brown rice and lentils) will also help as they provide a more sustained energy release. Try and cut out processed refined carbs such as white pasta, white bread and rice. Additionally, eating foods that are high in tryptophans will help to increase your levels of serotonin, a hormone that affects your mood. Dietary sources include walnuts, bananas, spinach, spirulina, dates and seeds. We would also advise cutting out any processed foods and reducing stimulants such as coffee and alcohol. Try replacing tea and coffee with herbal teas or natural substitutes such as Bambu and Barley Cup. Craving comfort foods can be another key issue for people affected by SAD. We would advise looking at balancing your blood sugar levels through adding more oats, cinnamon and blueberries to your diet whilst cutting out sugar-laden foods. The supplement chromium may also offer additional support for cravings. In addition to a vitamin D supplement, we would advise taking a magnesium supplement to help with mood and energy and a B vitamin supplement to help you adapt if you’re feeling stressed. B vitamins also help to release energy from the food we eat. Prebiotics and probiotics can also be very beneficial to combat the symptoms of SAD as research is now showing there is a strong link between gut health and the mind. Herb-wise, we would recommend saffron for people affected by low mood and depression as it’s been shown to be very effective in studies. It has been successful for many of our customers. We’ve also had a lot of success with ashwagandha. It’s an ayurvedic supplement that can help to lower levels of the stress hormone, cortisol. Research has shown it can help to alleviate stress, insomnia and depression. It can also help with fatigue and brain fog. It is one of our bestselling supplements. Getting outdoors during the winter months is also really important for your wellbeing. Additionally, yoga and meditation can really help with low mood and generally improving how you feel. This popular store stocks a range of products including wholefoods, sports nutrition, superfoods and homeopathic remedies. Bare Health prides itself on offering quality supplements at affordable prices. Ranges include Nature’s Aid, Viridian, Nature’s Plus and Terranova. The store offers regular events and workshops including a quarterly ladies night. In addition to the store, there is a complementary treatment centre. 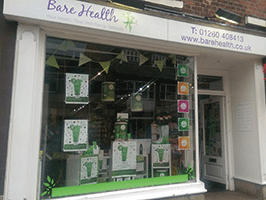 Opened in 2011, Bare Health has a team of four store staff and nine complementary therapists.